Here we will focus in our first mesoamerican faction. i found more related info to aspects that Tomcelmare request how is the climate of this guys, what they did, etc, some conceptual design, gameplay art. Etc. The central valley (average elevation 1,550 meters) has a temperate climate, the isthmus and other coastal areas are tropical and semiarid, whereas the sierra regions to the north and south, with variable elevations higher than the central valley, have a cooler climate than the temperate central valley. All regions experience dry and rainy seasons, the latter beginning in May and extending to October. Diverse microclimates exist in all of these regions. Is very similar to Tegucigalpa/around( my city ) actual weather. For example the dry is horrible righ now , we are in summer and is very dry. I need drink to much water. Look they practice this ritual too. They take their victims and zssss! sacrifícate to gods. Have slaves. Ceremonies. Traditionally, the Zapotee engaged in numerous rituals associated with their farming activities. Lightning, Cosijo, was seen as alive; the powerful deity was offered human blood, quail, dogs, human infants, and war captives in exchange for rain. The Valley of Oaxaca in southern Mexico has a long and complex history of human occupation and animal use, beginning more than 10,000 years ago. Human-animal relationships changed significantly throughout this time, with the earliest occupants hunting a wide variety of animals to fulfill their subsistence needs. By the Classic period, Zapotec meat diet relied largely on three to four main animals—deer, dog, rabbits, and eventually turkey—but each settlement had its own unique zooarchaeological signature. Site-specific animal specialties and preferences emerged as households and communities chose to specialize in the production of certain animals and animal by-products. At El Palmillo, the ancient Zapotec exploited rabbits as a food source, used their hair in textile production, and incorporated rabbits into ritual practices. Cottontail rabbits, in particular, became a favored animal resource among high-status families. Elite refuse contained the greatest amounts of rabbit skeletal remains, and ritual offerings of rabbits were restricted to these residences. Higher-status households also produced textiles using fine maguey and possibly cotton thread that likely incorporated rabbit hair. The best source of rabbit fur would have been from live animals kept near the residence. This leads to the question, were some households raising captive rabbits? Further research is required to answer this question; but, the zooarchaeology at El Palmillo provides solid evidence for rabbit specialization among elite families in the community. Recent excavations at the Mitla Fortress have produced the earliest and most comprehensive evidence to date of turkey domestication among the ancient Zapotecs. Two Classic to Early Postclassic period (ca. AD 300–1200) domestic residences have yielded the remains of juvenile and adult turkeys (both hens and toms), along with an egg-laying hen and unhatched and hatched turkey eggs (ranging from unfertilized or newly fertilized eggs to eggs nearing the termination of embryogenesis to hatched poults). Turkeys were used in rituals, and turkey bones were modified for use as tools and crafted into items of personal adornment. These data provide the earliest, unequivocal evidence that turkeys were being raised and kept by some families at the Mitla Fortress. Probably most interesting of the group. Another question that we continue to ponder regarding urns is why did the Zapotecs stop making this iconic artifact? What seems clear is that late in the Classic period, perhaps during the 8th or 9th centuries A.D., these urns, so symbolically rich and widely found in the Valley of Oaxaca, were no longer made, or at least they became much rarer. Some researchers might suppose that the decline of the iconic urns might relate to a population replacement of the valley Zapotecs by Mixtecs (who did not make such pieces nor revere Cocijo) at the end of the Classic period. But as I have commented before, the notion of a full-bore Mixtec invasion or population replacement in the valley does not have much empirical support. And the best evidences for a Mixtec elite presence (likely through elite intermarriages with Zapotecs) and accompanying cultural influences date to centuries after the decline of Zapotec urns. Rather, the decline in urns would appear to owe more to shifts in Zapotec society and cultural practice toward the end of the Classic period rather than to a cultural or ethnic replacement. With the Late Classic-period decline of Monte Albán and the rise of local rulers at a dozen or more outlying valley centers, the rituals associated with power, rule, and political legitimacy appear to have shifted, perhaps spelling a lessening role for long-held rituals in which powerful individuals portrayed Cocijo or other supernaturals (as often depicted in the urns). Perhaps, legitimacy was now gained more readily through lineal links to specific powerful forebears as depicted in Late Classic genealogical registers (discussed and illustrated in my 2008 Dispatches concerning El Palmillo) that illustrate sequences of ruling pairs, each specific to a single settlement or center. The above speculation remains no more than a viable hypothesis at present. Yet two sets of findings (one from 2008 at El Palmillo and the other from this season at the Mitla Fortress) that both date to late in the Classic period provide some tantalizing perspectives on ritual behavior during the last years of the Zapotec urn. I suppose that this topic should be in the RotE subforum? Or even better, merged with the other mesoamerican topics? Im not sure when the name becomes Terra...M I this will moved to that. the blacksmith must be changed to Armory. The icon I'm not sure if keep but I don't found an equivalent. dogs must be domesticated to food. same with turkey, turkey must be trainable in the corral. can be nice add a map about masoamerica theme, one about Oaxaca. Other in rainfall forest for a future mesoamerican. trinketos will work in Olmecs( I try to supervise and motivate) he improving his skills. change technologies to fix the mesoamerican developenmt. change iron for stone, in some values. Improve hunt skills and stats. we haven't Hero I ask many Mexican guys and many things about them are missing. add ( probably me) Nahuatl names, the Aztecs later have interaction with they and their invaders Mixtecs. i many work drawing icons know I have more tools. new animations is required for siege Warfare , Lordgood knows this. they must have bonus against cavalry the mace can kill a horse and the same with spear. the economic bonus is stone related , they work easy with stone, to build, to make weapons, etc. merchants must be represent by woman. Women create art, fabric, make food , herding and were the seller into the markets. they malus or disadvantage is the farming. the heros must be mythical names, they haven't no names... even some guys from Mexico says that. can be nice a feamale witch, they practice witchcraft and same as Roman that affects the morale. The walls of the astronomical observatory served as a great gallery to expose the conquests that were realized between the towns near and even in the distant ones; Thus, each of us and visitors can admire the great strength of our armies in their travels of expansion. Territorial possession is one of the reasons for going to war; The land is the most valued and profound value of this noble people, and conquering the neighboring territories we will have their lands producing corn for us. Therefore, and because our gods have sent us for that, we are indomitable warriors from the most remote times. We also know that that is the reason to remain on the warpath throughout our history, no matter how many new suns occur, our purpose will always be the same. When two princes married, as happened between the daughter of the lord of Zaachila and the Mixtec prince of Yanhuitlán, the father of the bride offered as a dowry the town of Cuilapam, thus ensuring family control over that population. Very important were the alliances between the benizáa and the Ñuusabi (Zapotecos and Mixtecos), since they allowed us to control several towns and therefore to have many slaves; We have already narrated in our books and lintels the military incursions of the great Mixteco lord Venado Garra de Tigre, whom we venerated as if it were our own by the alliances we established with him and which allowed us to expand even more control over vast territories. Venado means deer, Garra de Tigre means Tiger's Claw. Such has been the history of the conquests of our lords. Since time immemorial they have fought, they have captured nobles, they have obtained tributes for our life and arms for our constructions or fields of culture. They have also made intelligent alliances that allow us to continue to control the political and territorial power of Huaxyacac. Make the wars, the capture , were enslaved. We have the elite warrior. are same as regular but with their ranked costumes. 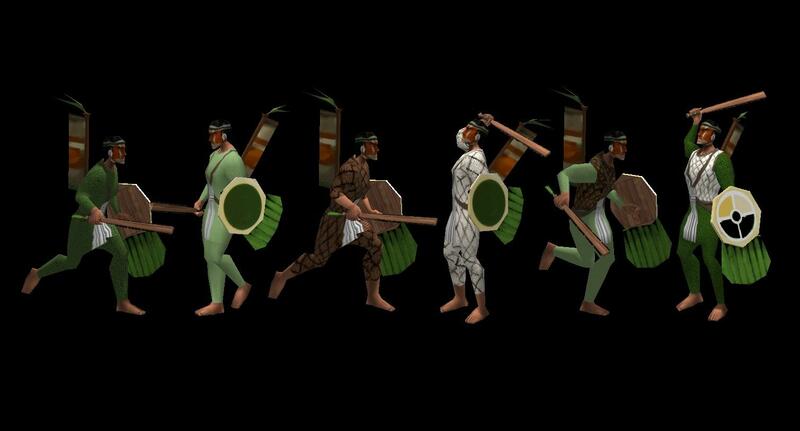 A Mexican fan suggest the Battle priest as fighter like a Druid with their ceremonial knife . - Captives can be sacrificed for buffs. Ideas from Empire Apart to Aztecs that are compatible with Zapotecs. Nahualt with rich words and forms. what mesoamerican civs are planned? To mods Zapotecs and pre classic and classic Mayans. @Lion.Kanzen can we use this for the Zapotecs? I'm currently creating textures for @Trinketos 's Aztec faction and thought if this textures also fit the timeframe of the Zapotecs. Any references that I could use?